BB (or VR?) loves rhubarb. It is not grown here (too warm) and not always easy to find. But, now is the season and some stores have a supply from Holland. 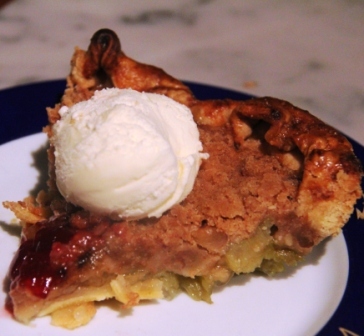 This pie is one of his favorites. It also won praise when served recently to guests. Serve it with a scoop of ice cream. about 1/4 cup red currant jelly, melted. Line pastry shell with foil, fill with rice or weights and bake in middle of pre-heated 425 F° oven for 10 minutes. Remove foil and rice or weights carefully and bake for another 3 to 5 minutes until shell is pale golden. Make filling: In a large bowl stir together sugar, tapioca, pinch of salt, vanilla, rhubarb and butter until mixture is well combined.. Let stand, stirring occasionally for 15 minutes. Make topping: In a large bowl stir together the brown sugar, flour, butter, cinnamon, walnuts and pinch of salt. Blend mixture until it resembles coarse meal. Spoon filling into shell, sprinkle streusel topping around the outer 2 inches of filling, leaving the center exposed. Brush the edge of the shell with some of the egg wash.. Bake pie on a baking sheet in lower third of the preheated oven (450 F°) for 15 minutes. Reduce oven to 350 F° and bake for 50 minutes to 1 hour or more until filling is bubbling and the rhubarb is tender. Brush exposed center portion of the filing with the jelly. Let cool on a rack for 2 hours.